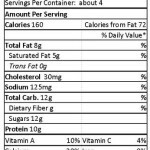 Before learning the kefir recipes, we should 1st know what are the nutritional content of kefir. 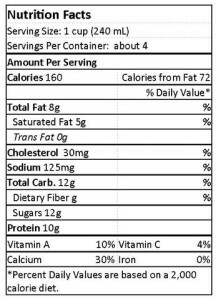 The kefir nutrition indicated in the image is just an approximation. Not all kefir drink have the same nutritional facts but it more or less in the range. To have a lifetime supply of kefir grains you simple just need to start creating your kefir drink, simply get your kefir grains and mix it with milk or brown sugar depending on what kind of grains it is, then the grains will multiply as many as you want. Place the tight weave cloth or cheese cloth in the strainer then place the strainer in a glass jar. 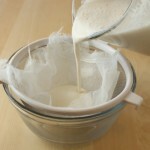 Pour the milk kefir into the cheesecloth. 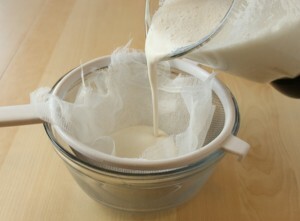 The glass jar will catch the kefir whey which is the liquid that will drop through the cheesecloth. Let it drain for 12-24 hours, after the milk kefir has stopped dripping you will get a lump of kefir cheese in the cheesecloth. Remove the kefir cheese in the cheesecloth and place it in airtight glass container then keep it re-fridge. Save the whey that has dripped into the bowl. You can make fermented drinks or cultured vegetables. Just place the whey in a glass jar in the fridge. You will normally get half of kefir whey and another half of kefir cheese. For the kefir whey, it can still be use like creating fermented drink, ingredients for sauce, mix it in a salad, smoothies and etc! In a bowl, combine the first three ingredients. Pour the kefir over top and stir. It will be quite thick already, and it will continue to get thicker as you let it sit. Feel free to add more/less kefir to your liking. Stir in the banana and add your desired toppings. In a clean bowl, combine first 5 ingredients. Blend in eggs. One at a time. Stir in kefir until moistened. Mix chocolate chips into the mixture. Cook on a griddle at 350º F.
In a clean mixing bowl, combine eggs and kefir. In a frying pan, cook mushrooms under medium heat with oil or butter until golden. Lower the heat and add egg-kefir mixture to the mushroom by spreading it evenly on the pan. Add cheddar when the omelette starts to set, but there is still some raw egg sitting on top. Remove the omelette from heat and use the handle to shake the omelette loose from the pan. Using your fork or spatula, fold it on top of itself. Spread half of the cheese on top of the tortilla and warm it in the toaster oven. While warming tortilla, stir the egg in a microwavable bowl. Mix in the rest of the cheddar and the kefir into it. Microwave the egg-cheddar-kefir mixture on high temperature for 1 minute and 5 seconds. Once the kefir mixture is done, the tortilla should be warm and the cheese melted. Egg that tortilla and roll it up. Top it off with salsa if you want. This recipe is good for 2 cups of smoothies. This recipe is good for 6 cups of smoothies. Add other ingredients from the add ins, as desired. I am pre diabetic and was provided a jar of kefir. I am not sure how much I should consume each day. Quantity of brown sugar to use to make a batch for consumption every two days. The time required for fermenting kefir. Keep it coming, writes, this is good stuff.